Google.com an automobile manufacturer soon? Well that’s not really the case, but in addition to its presence on the internet as #1 search engine, now they’re working on plan to create cars or taxi to be exact, that will drive itself based on commuters request where they want to go. I thought this has been on the radar for a very long time from various many cars manufacturer companies but it never happened? guess why? because cars manufacturer will go broke bankruptcy because they can no longer sell unique cars for people to drive, so some politics there. Anyhow, I see this as a car will not be unique, it’s a taxi, and many people know that most if not all taxi look the same. This new design will be electric and robotics so call “autonomous car”, it will drive you to the location where you want to go, it will pick you up and drive you to the location and pick you up again and take you back home or where ever you wanted to go. 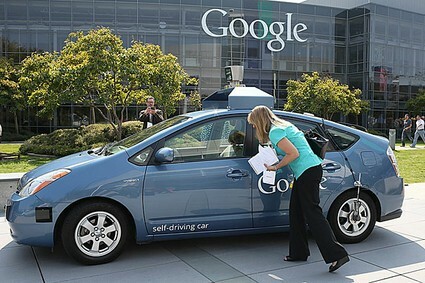 This should have happened long time ago, I am surprised that we don’t have one yet, although we have something similar, new cars, most have self parallel parking, auto disable or slow acceleration when car to close to vehicle in front, or lane change detect blind spot and many more but no self-driving completely yet. This entry was posted in Cars, Computers, Entertainment by admin. Bookmark the permalink.